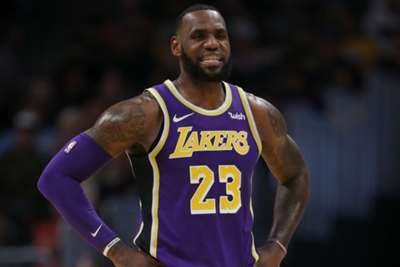 LeBron James gave his game-worn shoes to a Memphis Grizzlies employee as the Los Angeles Lakers claimed a 111-88 win at FedExForum. Three-time NBA champion James gifted his trainers to Grizzlies assistant equipment manager Brian'e Miller in the final minutes of the victory. Miller was visibly emotional after receiving a hug and the pair of LeBrons from the Lakers star. James, who finished the night with 20 points, nine assists and eight rebounds, explained his actions after the game. "Every year I've come here she's always worn a very exclusive pair of my shoes, and I've always noticed it. I've never said anything to her," James said. "Tonight I said something to her for the first time, and she was like, 'Yeah, I've always been team LeBron. Always.' So she got a pair of LeBrons." Miller said she has been a long-time James fan but was not anticipating such a display of kindness from the four-time MVP. "It's emotional because so many years I've been idolising him," Miller told Memphis newspaper The Commercial Appeal. "He has so many fans. That's the thing. I'm not a fan just when LeBron comes. I'm a fan when he's not looking, so it was just really cool to see him appreciate me. "I wasn't expecting that, to come to work today and I'm going to get LeBron’s shoes. It's just trying to do my job and he blessed me with a pair of shoes."